Blake was born at 319 Forrest Street in Baltimore Maryland to former slaves John Sumner Blake (1838–1917) and Emily "Emma" Johnstone (1861–1917). 1998: James Hubert Blake High School was built in Cloverly Maryland in his honor. James Hubert Blake (February 7 1887 – February 12 1983) was an American composer lyricist and pianist of ragtime jazz and popular music. Blake's compositions included such hits as "Bandana Days" "Charleston Rag" "Love Will Find A Way" "Memories of You" and "I'm Just Wild About Harry". 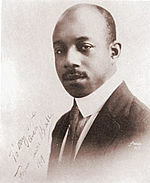 In 1921 Blake and long-time collaborator Noble Sissle wrote the Broadway musical Shuffle Along one of the first Broadway musicals to be written and directed by African Americans.